The ability to culture cells is fundamental for mass propagation and as a baseline for the genetic manipulation of plant nuclei and organelles. The introduction to Plant Cell Culture: Essential Methods provides a general background to plant cell culture, including basic principles, technologies and laboratory practices that underpin the more detailed techniques described in subsequent chapters. Whilst each chapter provides a background to the topic area and methodology, a crucial aspect is the provision of detailed protocols with emphasis on trouble shooting, describing common problems and detailed advice for their avoidance. Plant Cell Culture: Essential Methods provides the reader with a concise overview of these techniques, including micropropagation, mutagenesis, cryopreservation, genetic and plastid transformation and somatic cell technologies. This book will be an essential addition to any plant science laboratory's bookshelf. An essential laboratory manual for students and early-career researchers. 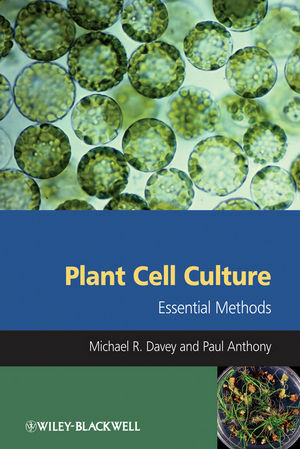 Michael R. Davey and Paul Anthony are the authors of Plant Cell Culture: Essential Methods, published by Wiley. 1 Plant Micropropagation (Ivan Iliev, Alena Gajdosova, Gabriela Libiakova, Shri Mohan Jain). 1.2.1 Explants and their surface disinfection. 1.2.2 Culture media and their preparation. 2 Thin Cell Layers: The Technique (Jaime A. Teixeira da Silva and Michio Tanaka). 2.2.2 Choice of material: Cymbidium hybrid. 3 Plant Regeneration – Somatic Embryogenesis (Kim E. Nolan, Ray J. Rose). 3.2.1 Selection of the cultivar and type of explant. 3.2.3 Preparation of culture media. 3.2.4 Sterilization of tissues and sterile technique. 3.2.5 Culture and growth of tissue. 3.2.6 Culture and induction of somatic embryos. 3.2.8 Transfer to soil – the final stage of regeneration. 4 Haploid Plants (Sant S. Bhojwani and Prem K. Dantu). 5 Embryo Rescue (Traud Winkelmann, Antje Doil, Sandra Reinhardt and Aloma Ewald). 5.2.1 Identification of the time and type of barrier in hybridization. 5.2.2 Isolation of plant material after fertilization. 5.2.3 Culture conditions and media. 5.2.4 Confirmation of hybridity and ploidy. 5.2.5 Conditions for regeneration of embryos to plants. 6 In vitro Flowering and Seed Set: Acceleration of Generation Cycles (Sergio J. Ochatt and Rajbir S. Sangwan). 7 Induced Mutagenesis in Plants Using Physical and Chemical Agents (Chikelu Mba, Rownak Afza, Souleymane Bado and Shri Mohan Jain). 7.2.1 Determination of the optimal doses of mutagens for inducing mutations. 7.3.1 Factors influencing the outcome of mutagenesis using chemical mutagens. 7.3.2 Factors influencing the outcome of mutagenesis using physical mutagens. 7.3.3 Facts about induced mutations. 8 Cryopreservation of Plant Germplasm (E.R. Joachim Keller and Angelika Senula). 8.2.7 Freezing of cold-hardened buds. 8.2.8 Freezing of orthodox seeds. 8.2.9 Freezing of pollen and spores. 9 Plant Protoplasts: Isolation, Culture and Plant Regeneration (Michael R. Davey, Paul Anthony, Deval Patel and J. Brian Power). 10 Protoplast Fusion Technology – Somatic Hybridization and Cybridization (Jude W. Grosser, Milica Calovic and Eliezer S. Louzada). 10.2 General applications of somatic hybridization. 11 Genetic Transformation – Agrobacterium (Ian S. Curtis). 11.2.1 Agrobacterium as a natural genetic engineer. 11.2.2 Vector systems for transformation. 12 Genetic Transformation – Biolistics (Fredy Altpeter and Sukhpreet Sandhu). 12.2.2 Optimization of gene delivery parameters. 12.2.5 Selection and plant regeneration. 13 Plastid Transformation (Bridget V. Hogg, Cilia L.C. Lelivelt, Aisling Dunne, Kim-Hong Nguyen and Jacqueline M. Nugent). 13.2.1 Principles of plastid transformation. 13.2.4 Identification and characterization of transplastomic plants. 14 Molecular Characterization of Genetically Manipulated Plants (Cristiano Lacorte, Giovanni Vianna, Francisco J.L. Aragao and El´ıbio L. Rech). 14.2.4 Analysis of the integration site: inverse PCR (iPCR) and thermal asymmetric interlaced PCR (Tail-PCR). 15.2.1 Medium scale disposable or semidisposable airlift reactors. 15.2.2 The RITA temporary immersion reactor. 16 Secondary Products (Kexuan Tang, Lei Zhang, Junfeng Chen, Ying Xiao, Wansheng Chen and Xiaofen Sun). 16.2.2 Scale-up and regulation of secondary metabolite production. 16.2.3 Detection of secondary products. 17 Plant Cell Culture – Present and Future (Jim M. Dunwell). 17.3.2 Commercial exploitation of somatic embryos. 17.3.3 Molecular aspects of somatic embryogenesis. 17.4.1 Haploids and their exploitation. 17.4.2 Induction of haploid plants. 17.4.3 Molecular aspects of haploid induction from microspores. 17.4.4 Ab initio zygotic-like embryogenesis from microspores. 17.6.2 Regeneration and transformation techniques. 17.7 Protoplasts and somatic hybridization. 17.8.1 Production of plant products. 17.8.3 Production of food ingredients. 17.10 Intellectual property and commercialization. 17.10.2 Sources of patent and other relevant information.